For those of you that have not used Footnote it is the online outlet for the National Archives. You can search for free, and there is quite a bit of free content, but most of it is premium content that requires a subscription. A subscription goes for about $75 per year and with that you can download and save all the premium images. It is also available at no charge through most Family History Centers. Footnote is full of interesting items such as City Directories for several major cities, Continental Congress items, naturalizations and homestead records from a couple different places. Vital records from assorted places and times, the Brady Photo Collection from the Civil War, and newspapers from all over the country. It is of course also home to Project Blue Book – UFO Investigations and that’s free!!! 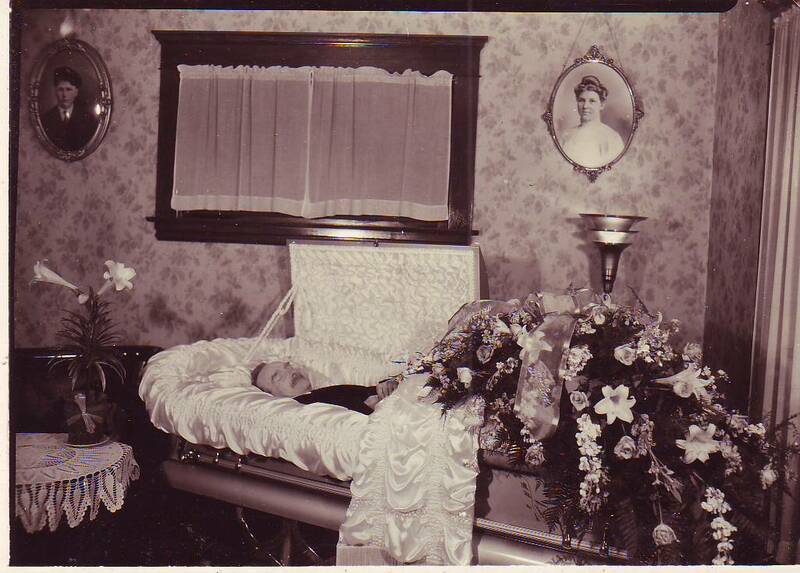 I conducted a search for Samuel N. Whittle and got a return for 1777 items. The first item was a Pension File Index for Maryland and the second item was for a Boston City Directory. I chose to add a discriminator of Maryland in the keyword area and reduced the hits to 105. The first item was a premium image of the Pension File Index. The image of the card states what we already knew about his Company and Regiment. It records his application for an Invalid Pension 23 Jun 1880, application number 390088 with a certificate number of 272124.1 No widows or minors pensions were applied for. The rest of the items were newspaper items from places where Samuel did not live. The joy and sorrow of OCR scanned material!! Footnote.com utilizes the Organization Index to Pension Files of Veterans Who Served Between 1861 and 1900. Ancestry.com utilizes the Civil War Pension Index: General Index to Pension Files, 1861-1934. So what’s the difference? The General Index to Pension Files, 1861-1934 T288. 544 rolls. This is an alphabetical index by veteran’s surname. The Organization Index to Pension Files of Veterans Who Served Between 1861 and 1900, T289. 765 rolls. This index is based on the military unit or Organization. The cards are alphabetical by state, then the branch of service (artillery, cavalry, etc), then by regiment (numerically), and then alphabetical again by the surname of the veteran. Footnote has made the Organization Index searchable by the veterans name. Both are valuable resources for the person searching for their ancestor that might have served in that time period. Now I have to go back and look at all my Civil War ancestors to make sure that I have checked both records! 1. 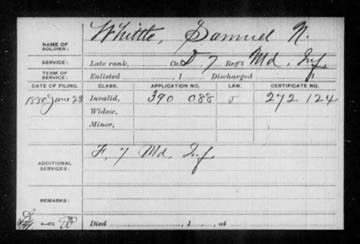 “Civil War Pensions Index,” database and images, Footnote.com (http://www.footnote.com : accessed 29 Sep 2008); Pension Record of Samuel N. Whittle; citing the General Index to the Pension File. 2. 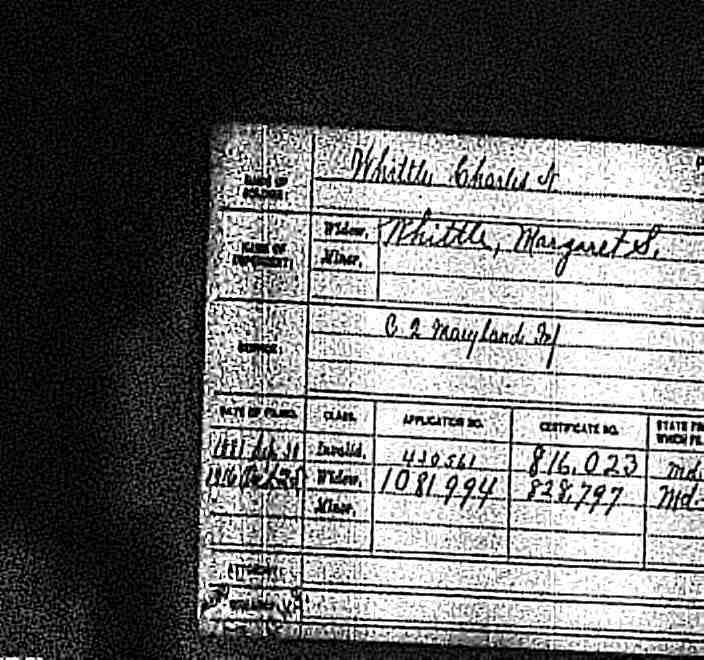 “Civil War Pensions Index,” database and images, Footnote.com (http://www.footnote.com : accessed 29 Sep 2008); Widows Pension Application about Charles Whittle; Citing the Organizational Index to the Pension Files. 3. 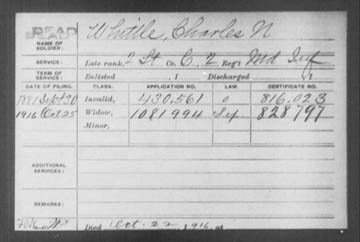 “Civil War Pension Index: General Index to Pension Files, 1861-1935,” database and images, Ancestry.com (http://www.ancestry.com : accessed 7 Oct 2008); Widows Pension Application about Charles White; Citing the General Index Pension Index.